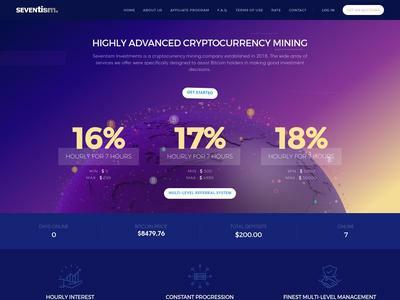 Seventism Investments is a cryptocurrency investment company established in 2018. The wide array of services we offer were specifically designed to assist Bitcoin holders in making good investment decisions. The amount of 5 USD has been withdrawn from your account. Accounts: U4222871->U15618161. Memo: Shopping Cart Payment. Deposit to Seventism Investments User nelomota.. Date: 11:53 21.05.18. Batch: 215342136. The amount of 0.3 USD has been deposited to your account. Accounts: U15618161->U14806480. Memo: API Payment. Withdraw to legithyipseu from Seventism Investments.. Date: 19:21 21.05.18. Batch: 215382860. 21.05.18 19:37	Receive	Received Payment 0.3 USD from account U15618161 to account U13350807. Batch: 215384122. Memo: API Payment. Withdraw to bankhyip from Seventism Investments. The amount of 0.3 USD has been deposited to your account. Accounts: U15618161->U5515759. Memo: API Payment. Withdraw to allhyipzone.com from Seventism Investments.. Date: 19:56 21.05.18. Batch: 215385502. $0.30 has been successfully sent to your PerfectMoney account U1996577. The amount of 0.8 USD has been deposited to your account. Accounts: U15618161->U4222871. Memo: API Payment. Withdraw to nelomota from Seventism Investments.. Date: 19:11 21.05.18. Batch: 215382042. The amount of 1.6 USD has been deposited to your account. Accounts: U15618161->U4222871. Memo: API Payment. Withdraw to nelomota from Seventism Investments.. Date: 18:11 21.05.18. Batch: 215377140. The amount of 1.2 USD has been deposited to your account. Accounts: U15618161->U4222871. Memo: API Payment. Withdraw to nelomota from Seventism Investments.. Date: 16:25 21.05.18. Batch: 215367095. $0.30 has been successfully sent to your PerfectMoney account U3202457. Hyipuniverse.com: Always fresh information about all hyip programs at the one site! Memo: API Payment. Withdraw to CFMonitor from Seventism Investments.. The amount of 0.3 USD has been deposited to your account. Accounts: U15618161->U15106421. Memo: API Payment. Withdraw to tradersmonitor from Seventism Investments.. Date: 21:36 21.05.18. Batch: 215393783. The amount of 9.35 USD has been deposited to your account. Accounts: U15618161->U2631114. Memo: API Payment. Withdraw to MYINVESTBLOG from Seventism Investments.. Date: 06:33 22.05.18. Batch: 215418409.